When Melanie Marsh learns that her son Daniel is autistic, she becomes determined to fight to teach Daniel to speak, play, and become as normal as possible. Melanie’s enchanting disposition has helped her weather some of life’s storms, but Daniel’s autism may just push her over the brink, destroying her resolute optimism and bringing her unsteady marriage to its end. Surprisingly funny yet deeply moving, Daniel Isn’t Talking is the story of a mother and a family in crisis. 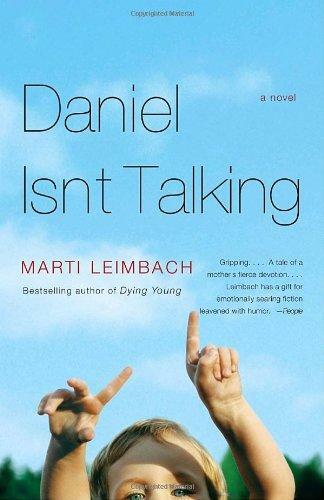 What sets it apart from most novels about difficult subjects is Marti Leimbach’s ability to write about a sad and frightening situation with a seamless blend of warmth, compassion, and humor. Marti Leimbach is the author of several novels, including the international bestseller Dying Young, which was made into a major motion picture starring Julia Roberts. Born in Washington, D.C., she attended the Creative Writing program at the University of California, Irvine, and Harvard University. She currently lives in England and teaches at Oxford University’s Creative Writing program. There are occasional flashbacks throughout the novel that give a glimpse of what Melanie was like before she had children. How would you describe her character before she became a mother? How has she changed? Melanie and Stephen’s house empties out of possessions as Melanie sells their things to pay for Daniel’s various therapies and other needs. What does Melanie mean when she says, “I’m in a different market than the rest of the world”? How are the subjects of race and class treated in the novel? Andy says he understands Melanie as an “autism mom.” What is the implication of this term? How might Andy’s perception of “autism moms” be different than that of most people Melanie encounters? When Melanie tells Veena about Daniel’s diagnosis, she makes an outright appeal for Veena’s compassion and sympathy. Instead, Veena says, “You are a white woman living in a white woman’s paradise. This is not the worst thing that can happen.” What does Veena mean by this and why would Melanie find the words comforting? How do you describe the connection between Melanie and Veena? How are these apparently very different women similar? What about their circumstances helps them to understand each other? Would they have been friends if Daniel were normal? Early in the novel Melanie thinks she may be “unstable.” Would you agree with that? Following Daniel’s diagnosis, does she seem more or less “stable” to the world around her? To you as reader? On the morning of Daniel’s diagnosis Melanie’s immediate reaction to the diagnosis is to say, “I feel that a change has taken place. I cannot help but feel as though I started the journey this morning with my beloved little boy and am returning with a slightly alien, uneducable time bomb.” How has Daniel’s diagnosis temporarily changed his mother’s perception of him? What examples can be seen of her resisting this changed perception? How has Stephen’s view of his son been altered by the diagnosis? How does Daniel’s diagnosis affect his sister, Emily? In what ways does Melanie try to shield Emily from the full implications of having a brother with autism? In what ways is she successful? In what ways is she not successful? In what ways was Stephen’s departure useful in helping Daniel? In the long run, was Stephen’s departure a good thing for Daniel? For Emily? How might things have been different for the children if Stephen had stayed? At the end of the novel Melanie states that Stephen “has shifted all blame for our marriage onto me. On to my whims and desires. At the same time he has cleverly cast his bid. He is smart. Maybe that is what I found so attractive about him. I do not find it so attractive now.” How has Stephen made Melanie feel responsible for the failure of their marriage? Do you think she is to blame? Melanie says that Andy “has touched a part of me that was dying and brought it to life once more. This belongs to him.” What does Melanie mean by this statement? What is the unusual nature of Melanie and Andy’s connection and deepening relationship? What do they know about each other’s families and backgrounds? Does this matter? In Chapter 23 Melanie sees a group of young women at a bus stop. About one of them she says, “I want to tell her that she is a woman of great virtue. A woman of grace. That I admire her. And that I see her differently than perhaps she sees herself. Now that I have truly seen her, now that I have taken notice.” In what sense has Melanie “truly seen” this young woman? What stops her from speaking to the woman?